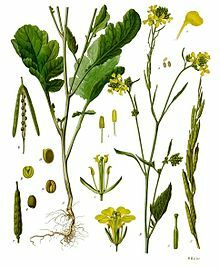 Brassica nigra, the black mustard, is an annual plant cultivated for its black or dark brown seeds, which are commonly used as a spice. It is native to tropical regions of North Africa, temperate regions of Europe, and parts of Asia. It is an upright plant, with large stalked leaves. They are covered with hairs or bristles at the base, but on the stem smoother. It can reach up to 80–90 cm (31–35 in) tall or even up to 2.4 m (8 ft) in moist fertile soil. It blooms in summer, from May (in the UK) onwards. The flowers have four yellow petals, which are twice as long as the sepals. Each stem has around four flowers at the top, forming a ring around the stem. Later, the plant forms long seed pods, that contain four rounded seeds. It was formally described by Karl Koch in “Deutschl. Fl.” (or Deutschlands Flora) ed.3 on page 713 in 1833. This was based on a description by the Swedish botanist Carl Linnaeus. The Latin specific epithet nigra is derived from the Latin word for black. This is due to the black seeds. It is native to tropical regions of North Africa, temperate regions of Europe and parts of Asia. It is found in North Africa, within Algeria, Egypt, Eritrea, Libya, Ethiopia, Morocco and Tunisia. Within Asia it is found in Afghanistan, Armenia, the Caucasus, China (in the provinces of Gansu, Jiangsu, Qinghai, Xinjiang and Xizang), Cyprus, India, Iran, Iraq, Israel, Kazakhstan, Lebanon, Syria and Turkey. In eastern Europe, it is found within Belarus, Moldova and Ukraine. In middle Europe, it is in Austria, Belgium, Czech Republic, Germany, Hungary, Netherlands, Poland, Slovakia and Switzerland. In northern Europe, in Ireland and United Kingdom. In southeastern Europe, within Albania, Bosnia and Herzegovina, Bulgaria, Croatia, Greece, Italy, Macedonia, Montenegro, Romania, Serbia and Slovenia. Also in southwestern Europe, it is found in France and Spain. It was introduced to the Pacific coast of North America and is considered an invasive species. More than 2,000 years ago, the plant was used as a condiment, it was mentioned by the Roman author Columella in the 1st century A.D. The plant leaves were also pickled in vinegar. In 13th century France the seeds were ground and used. They were mixed with partially fermented grape juice to create “mout-ardent” (or burning must). This became later “moutarde”, now called mustard in English. A spice is generally made from ground seeds of the plant, with the seed coats removed. The small (1 mm) seeds are hard and vary in color from dark brown to black. They are flavorful, although they have almost no aroma. The seeds are commonly used in Indian cuisine, for example in curry, where it is known as rai. The seeds are usually thrown into hot oil or ghee, after which they pop, releasing a characteristic nutty flavor. The seeds have a significant amount of fatty oil, mainly oleic acid. This oil is used often as cooking oil in India, it is called “sarson ka tel”. In the UK, the plant was used to make “hot mustard baths”, which would aid people with colds. Ground seeds of the plant mixed with honey are widely used in eastern Europe as cough suppressant. In Eastern Canada, the use of mouche de moutarde to treat respiratory infections was popular before the advent of modern medicine. It consisted in mixing ground mustard seeds with flour and water, and creating a cataplasm with the paste. This cataplasm was put on the chest or the back and left until the person felt a stinging sensation. Mustard poultice could also be used to aid muscular pains. Since the 1950s, black mustard has become less popular as compared to India mustard, because some cultivars of India mustard have seeds that can be mechanically harvested in a more efficient manner. Despite their similar common names, black mustard and white mustard (genus Sinapis) are not closely related. Black mustard belongs to the same genus as cabbage and turnips. ^ a b c d e f Reader’s Digest Field Guide to the Wild Flowers of Britain. Reader’s Digest. 1981. p. 41. ISBN 9780276002175. ^ “Brassica nigra (L.) K.Koch is an accepted name”. theplantlist.org. 23 March 2012. Retrieved 9 November 2017. ^ “Brassicaceae Brassica nigra (L.) W.D.J.Koch”. ipni.org. Retrieved 9 November 2017. ^ a b “Taxon: Brassica nigra (L.) W. D. J. Koch”. ars-grin.gov. Retrieved 9 November 2017. ^ Panzar, Javier (25 April 2019). “This super bloom is pretty dangerous: Invasive mustard is fuel for the next fire”. Los Angeles Times. Retrieved 25 April 2019. ^ “black mustard Brassica nigra”. Early Detection & Distribution Mapping System. The University of Georgia – Center for Invasive Species and Ecosystem Health. Retrieved 25 April 2019. ^ O’Sullivan, Eve (17 February 2014). “How to cook with mustard seeds”. The Guardian. Retrieved 9 November 2017. ^ “Mustard Seeds / Rai / Sarson”. food-india.com. Retrieved 9 November 2017. ^ Mejia-Garibay, B.; Palou, E.; Guerrero-Beltrán, J.A. ; López-Malo, A. (June 2015). “Physical and antioxidant characteristics of black (Brassica nigra) and yellow mustard (Brassica alba) seeds and their products”. Arch Latinoam Nutr. 65 (2): 128–35. PMID 26817385. ^ Borah, Plavaneeta (30 November 2016). “8 Incredible Mustard Oil Benefits That Make It So Popular”. ndtv.com. Retrieved 9 November 2017. ^ Post, George Edward (1900). “Mustard”. In James Hastings (ed.). A Dictionary of the Bible.